When Guido Morselli took his own life at the age of sixty, Italy may well have lost one of its finest writers. Up until the time of his death in 1973, not one of Morselli’s novels had been accepted for publication; all seven were subsequently published in Italy, where Morselli now seems to have gained the recognition he so richly deserved at the time. Sadly for us, only one of his books appears to be available in English: Divertimento 1889, an utterly charming story of an escape from royal life during the Belle Époque period of the late 19th century. Morselli uses Umberto I, King of Italy from 1878 to 1900, as a model for his fictional protagonist. As the novel opens, we find the King in his office in Monza (the Royal Place in the North of Italy), weighed down by a mountain of paperwork and official duties. His mood is somewhat dispirited as he reflects on the tedium of life as a royal, a role that offers him very little satisfaction or sense of achievement. It soon becomes clear that the King is living beyond his means. He is married, there is his lover to think of, plus the estates to maintain, all of which means that his outgoings have been exceeding his incomings in recent years. Luckily for the King, a solution may be close to hand. When one of his advisers, the rather dashing Vigliotti, informs him that a lady has expressed interest in purchasing one of his properties – a rustic castle in Monferatto – the King sees an opportunity to solve all his financial problems. With this in mind, he dispatches Vigliotti to Switzerland to sound out the lady in question, a certain Frederika von Goltz. As Frau von Goltz is currently convalescing at home in Wassen, the King wonders whether this development might not present another lucky break. Why not accompany Vigliotti to Switzerland so as to be on hand if required during the negotiation of the sale? Furthermore, as The King is keen to keep any potential deal under wraps, a plan begins to hatch in his mind – why not travel incognito? It would be a chance to experience life as an ordinary human being, even if only for a week or two. All at once his mood lightens considerably. Once the requisite preparations have been made, the King and a small group of his most trusted advisers set out by train, the ‘official’ reason for their visit being a hunting trip to the Swiss Alps. The King, who is travailing under the alias of Count Moriana, is delighted to arrive at his destination in Goeschenen; the Hotel Adler is simple yet comfortable. The next afternoon, the King discovers one of the small pleasures in life as he takes a leisurely walk by himself. Unlike all the other foreign visitors who stop to gaze at the landscape surrounding Goeschenen, the King is lost in his own thoughts; nothing else exists outside the private happiness of his world. Other pleasures await the King while he remains undercover: a spot of shopping in the town; a quiet game of cards now and again; there is even time for a dalliance or two. The King is rather taken with Clara Mansolin, Vigliotti’s beautiful young fiancée who is also staying in the hotel. The attraction is mutual. In this scene, one which illustrates the wonderfully comic tone of this novella, the King is running through his moves in preparation for a secret rendezvous with Clara. Perhaps inevitably, certain developments threaten to disturb the King’s escapade. An inquisitive journalist happens to recognise Clara, an old flame from his past. Closer inspection of the party reveals the true identity of the Count, leaving the journalist with a potential scoop on his hands – what is the King of Italy doing on an undercover mission in Switzerland? Secret talks of a political nature, perhaps? Furthermore, the King’s cousin, Kaiser Wilhelm, appears to be threatening to pay him a visit, a development that causes no end of confusion among the royal advisors. The King has absolutely no time whatsoever for his zealous young cousin, a point that becomes abundantly clear from the following passage. Divertimento 1889 is a captivating story, a celebration of the joys of freedom and the need to escape from one’s duties every now and again. Morselli’s sprightly prose, with its lively humour and somewhat farcical tone, mirrors the delights of upping sticks and going off on a lark to enjoy the simple pleasures in life. On the surface, it may seem a touch frothy, an entertaining tale with no real wisdom to impart. Dig a little deeper, however, and there are other insights to uncover. Morselli’s story touches on the development of technology, echoing a theme that remains all too relevant today – can we ever truly escape from all forms of communication – in the King’s case the telegraph – when in need of a little solitude? Perhaps the novella’s most poignant message relates to the passing of time. I loved the following quote, a passage that encourages us to savour every moment of life before it slips away. I’m delighted to have discovered this little gem via Scott’s excellent review over at the seraillon blog. The book is currently out of print, but second-hand copies are available online. It would be wonderful to see it back in circulation with a publisher such as Pushkin Press or NYRB – I’d like to think that it’s just their type of thing. Divertimento 1889 was published by EP Dutton (Obelisk). Source: Personal copy. This entry was posted in Book Reviews, Morselli Guido and tagged #TranslationThurs, Book Review, EP Dutton, Guido Morselli, Hugh Shankland, Italy, Literature in Translation, NYRB Classics, Obelisk, Pushkin Press on March 3, 2016 by JacquiWine. I am ashamed at how little I know my Italian writers, even though the language and way of thinking should be very familiar to me. 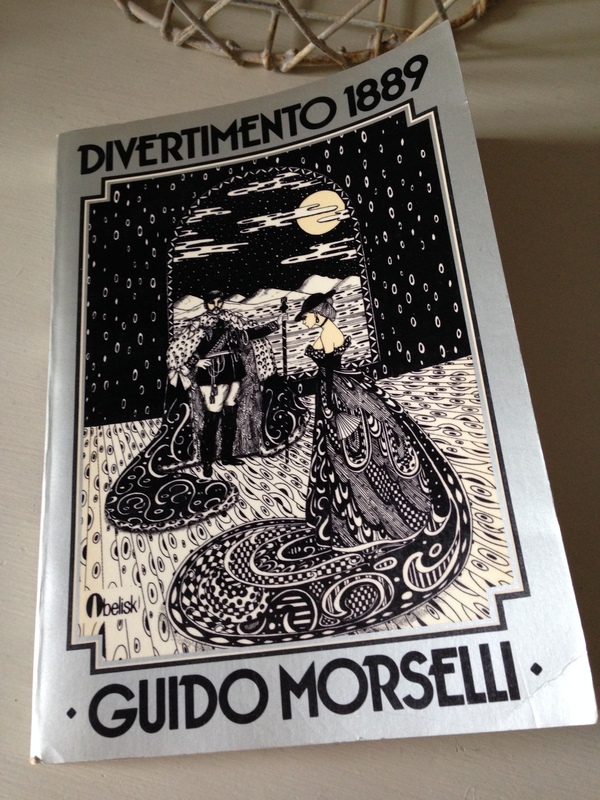 Poor Morselli – not one of his novels published – no wonder he committed suicide. A bit like Van Gogh! Very tragic. The book comes with an excellent introduction by the translator, Hugh Shankland. By all accounts, Morselli suffered from depression for much of his adult life. He experienced the carnage of war (‘the most catastrophic and futile wart in history’) in Southern Italy during ‘the Italian debacle of July-September 1943.’ When his unit was disbanded, he remained marooned in Calabria for nearly three years, homesick and penniless, unable to get word to his family or to the woman he loved. During this intensely lonely time, he began to keep a detailed working journal which he maintained for the rest of his life. Great review, seems a shame that it is out of print, though good to hear available on-line second hand. Thank you. Yes, luckily I was able to find a copy online!. Sounds absolutely wonderful Jacqui – and a great review. Yet another European writer who’s slipped out of print, and let’s hope someone picks up his books! Thanks, Karen. I thought this was absolutely wonderful, a real find! It would be lovely to see it back in print with Pushkin, NYRB or another enterprising publisher of that ilk. What a great review! It really does make you wonder about all the fantastic writing that has been allowed to go out of print. Gems waiting to be found. Thanks, Cathy. Yes, doesn’t it just! Grant (of the 1streading blog) runs a ‘Lost Books’ feature every now and again, highlighting gems that have fallen out of print. It’s surprising to see just how many great writers have slipped through the net. That’s something I’d love to look in to within Orish literature if I just had the time!! That would be a great feature – very educational, too. It’s hard to find the time to do everything, though. Maybe you could you highlight one or two Irish writers that are ripe for rediscovery? Great review as always Jacqui. The idea of the telegraph making contact with the world at large is so interesting. If this book had not been written more then forty years ago, it would have seemed that the author was drawing parallels to our modern digital age. When one thinks about, this topic has now been relevant for a very long time. Thanks, Brain. Yes, the ideas behind those points on communication are still very relevant today. Even in the late 19th-century, it would have been hard for someone in a position of importance to cut themselves off from all possible forms of communication. We all need to get away from things every now and again, and I think Morselli’s story plays to that idea very effectively. Great review, I see several of his books are available in French. The prose sounds fantastic. Thanks, Emma. I loved the style, and Morselli’s prose is wonderful. Good to hear that several of his books are available in French – that’s great news. Some of the books are available in German as well, though they are second-hand copies as well. Only two of the books had one rating on Amazon. How sad! I’m glad that you brought some attention to Morselli and this book. It’s nice to think that even though this story was written a while ago, it still has some relevance and is entertaining on top of it. It is pretty special, a charming little escapade! Yes, me too. Even though I’m not a royalist, I do have some sympathy for them. Imagine being born into that world through no choice of your own…it must feel terribly stifling at times despite the upsides. It does sound fun. I’m reminded of Szerb’s Oliver VII (my favourite Szerb) where a king goes incognito and ends up heading the resistance to his own reign. This sounds slightly less fanciful (though Oliver VII is wonderful) but still very fun. Emma’s right that it’s funny that his idea of an ordinary man is a Count. How long is it overall? Ooh, that reminds me – I had Oliver on an old wishlist, but he seems to have dropped off somewhere along the line. I shall have to reinstate him, especially if it’s your favourite of the Szerb’s you read to date. Divertimento is 140 pages, plus a short intro from the translator. I read it in an afternoon. It’s absolutely delightful! I’m so glad you liked this, Jacqui. I found this little novel to be one of the best things I read last year, a rare blend of quirkiness, charm, and something quite a bit darker. For all of its wit and undeniable “diversion,” the sense of entrapment not only by mortality but also by institutions – and by the whims of those in power – makes it almost chilling. This is not a simple “trading-places” kind of story. The Chicago Review last year published a very funny except from Morselli’s novel The Communists, so I’m hoping the rest of the book finds its way into English soon. There is one other of his novels already translated as Past Conditional, a counterfactual revision of World War I. I have not yet read it. I loved it, Scott! Thanks so much for writing about it in the first place as I would never have discovered it otherwise. You’re right about the theme of entrapment by institutions, that sense of feeling restricted in life. (In fact, I probably should have mentioned a little more about the darkness in my review.) There’s a melancholy undercurrent running through this story, and I felt it quite strongly particularly towards the end. Oh, and thanks for the update on Morselli’s Other work. Now I think about it, your description of Past Conditional sounds familiar, so I’m wondering if we had discussed it in the comments to your review of Divertimento! Anyway, good to know it’s available in English – are you planning to read it at some point? The Communists sounds very promising too. I do plan to read Past Conditional later this year. Also, I’ve just confirmed that The Communist has indeed been translated in full and will appear next year. Cool. I’ll be very curious to hear your thoughts on Past Conditional – the premise sounds very intriguing. Great news about The Communist, too. Thanks for that, Scott. A rather unique comedy, I think. But, what about the king and Clara? I bet it’s going off to the “secret affair” way, isn’t it? I bought this after Scott’s review too. I think you’ll like it, Guy. I haven’t read him yet. Such a sad story. One more Italian writer who ended his life. I need to see what’s available in other languages.